The Embed Form field allows you to embed one form inside of another. The Embed Form field is especially useful if you want to use the same field, or group of fields, in several forms. A form can't be embedded in the same form more than once, but one form can be embedded into as many forms as you would like. Please note: Repeating sections, page breaks, and embedded forms are not set up to work inside of an Embed Form field. Select the form you would like to embed into your current form. Go into edit a form. The title of the Embed Form field will not show on the front end, it will only show on the back-end. Click on the field options and where it says Insert Form, select the form that you would like to embed. You may style the Embed Form field as a whole or you may style the fields individually. 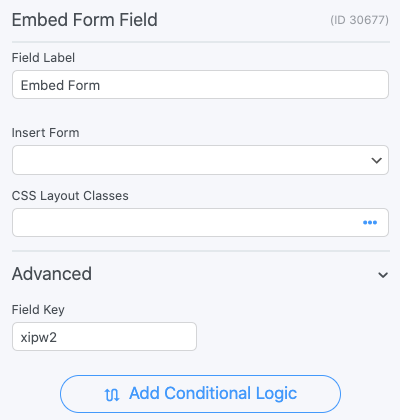 If you want to add a class to the entire embedded form, open the field options for the Embed Form field and insert a class in the CSS Layout Class box. When you add a CSS layout class to an Embed Form field, that class will apply to all fields in that embedded form. To style the fields individually, go into the form that the Embed Form is pulling data from. You can add classes to the individual fields CSS Layout Classes in their field options. The embed form field saves the id of the entry in the child form. To display this id in a view, use the id of the embed field added in your parent form, ie . Embedded forms are not designed to have a repeating section, page break, or another embedded form in them. This is not something we are supporting at this time. In addition, a form cannot be embedded in the same form more than once. An embedded form cannot be placed within a section. An embedded form can't create posts. Determine whether the actions are triggered for an embedded form with the frm_use_embedded_form_actions hook. Prevent embedded form entries from being deleted when the parent entry is deleted with the frm_before_destroy_entry hook.